If you are more of a perfectionist, you will agree that getting the cleanest cut of your woodwork is your everyday dream. Whether you are working on a small or huge workpiece, you know you’ve got to get the right machine. In this case, a miter saw would do you good with guaranteed results, seamlessly, and the finest. It’s every professional’s understanding that getting a fine cut out of a workpiece needs precision. The normal saws most people use are manual by nature and would not guarantee the best results. However, with the best budget miter saw, you would get things done perfectly and within a fraction of your time. This review gets you all the details you need to know about the best budget miter saws. You will also read through our best pick, buying guide, and the frequently asked questions. How does the best value miter saw work? Our top pick for the best budget miter saw is the DEWALT DW715 15-Amp 12-Inch Single-Bevel Compound Miter Saw. The saw comes armed with every component you will need to get the clearest cut out of your workpiece. Also armed with a carbide blade, blade wrench for loosening or tightening tasks, comfortable side handles fitted in the base, and a dust bag, you could never ask for anything better. Arbor size – 5/8" or 1"
Fitted with carbide blade, dust bag, and blade wrench. Adjustable stainless seal miter detent plate. Eleven positive stops on the detent plate. The DEWALT DW715 Single-Bevel Compound Miter Saw is an ideal saw for perfectionists as it is designed with a 15-amp motor. This offers it the strength, durability, and power to run the blade at 4,000 rpm. The product also guarantees the user repeatable accuracy with ease of adjustment offered by the stainless-steel miter detent plate. The saw also has tall sliding fences that support 6-1/2in and 5-1/4in of base modeling and crown modeling respectively. It would also be ideal to move between workstations as it boasts of a lightweight design as well as a built-in carry handle that enhances portability. If you need increased capacity, this saw offers it with bevels of 0-48 degrees to the left and 0-3 degrees to the right. It might also be ideal for anyone looking for greater versatility as it features a 0-50 degrees miter to the right and left. It features an adjustable stainless steel miter detent plate. Lightweight design with a carry handle. Fences might not be parallel for all models, and the buyer has to check before buying. Fitted with a 24T TCT saw blade. Has a dust bag, 5mm bar wrench, and a dust bag. It is also fitted with a holder for ease of movement and operation. The Hitachi C10FCG 15-Amp 10" Single Bevel Compound Miter Saw is an ideal tool for woodworkers looking for reliability, precision, and versatility. Thanks to its 15-amp motor that generates a 5,000 RPM no-load speed, getting things done for them will be easier and faster. The tool would also be ideal for anyone looking for ease of making crosscuts even when they are working on the toughest jobs thanks to its speed and stability. The product might also be a great deal for anyone looking for flexibility as it offers that seamlessly with its 0-52 degrees miter angle range both to the left and right. The tool also offers a 0-45 degrees bevel range to the left which ensures it provides a clean and accurate bevel cut. The user may also be at liberty to use the saw where it is most convenient with them. This is thanks to the lightweight design of about 24.2 lbs that allows for maneuverability and easier transport. The product may also favor everyone who needs an assurance they are protected from airborne particles as it comes with a dust bag. Slightly hard to lock the miter cam. The laser is a bit dim. Capacity: can cut nominal 2x6 and 4x4 at 90 degrees as well as 2x6 at 90 degrees at one go. Has a spindle lock for holding back the blade during changes. It is fitted with a dust bag. The Homecraft H26-260L 10-Inch Compound Miter Saw would be an ideal tool for both professionals and DIYers who are looking for a lightweight yet effective tool. It weighs only 18 pounds making it easily portable. It may also be the ideal tool for a DIYer who is not such a professional at using it since it works with virtually all miter saw stands. It also has an ergonomic handle that ensures safe and predictable operation. If the user is looking for speed and precision, the saw would also come into their rescue with its powerful 14-amp motor that cuts through a workpiece at a blade spin of 5,500 rpm. Lightweight – weighs only 18 pounds making it easily portable. Has a red laser light that is bright enough to illuminate the cut line. The 14-amp motor might not be powerful enough to work on thicker woods. The blade is rough and does not provide for a fine finish. Has a battery-powered laser and might need constant replacement of the batteries. Features a 60-tooth carbide tipped blade. It is fitted with a dust collection bag. Has a carrying handle for portability. It is fitted with an automatic blade cover that retracts during operation for maximum safety. The WEN 70716 10-Inch Sliding Compound Miter Saw features a powerful 15-amp motor that offers speed and durability running the blade at 5,500 rpm. This would be ideal for professionals or DIYers looking for a faster way of working on many workpieces at a go. The product would also be ideal if you are allergic to dust particles as it has a dust collection bag that minimizes the spread of sawdust. The saw also offers a wide and spacious worktable allowing the user to work on small and large wood pieces. With its versatility, the product offers the user different cutting choices. As such, the user can cut straight, compound, miter, and bevel from one machine. The product would also be ideal for slicing diameters of up to 3.25 inches thick thanks to its 15 amp slicing power. It is fitted with a handle making portability easy. Offers cutting versatility with the options of a straight, compound, miter, or bevel slicing. The work table has two support arms, a hold-down clump as well as an automatic blade cove that retracts during operation to minimize accidents. A bit heavier with at least 30 pounds of weight. Does not have a laser line. 5 hardened steel bevel stops. Top clamp to increase cut accuracy. Carrying handle for ease of portability. The Miter Saw, Tacklife 15Amp 12inch Single Bevel Saw would be a multi-users great friend since it is versatile. It has two blades, one for plastics and similar materials and the other for wood. It would also be a great asset for a professional and amateur DIYer since it offers a laser-guided cutting. This ensures the cutting is straight, accurate, and professional. If the user is an amateur, they can use this product without fear of accidents. It is fitted with four blots for fixing the tool on the horizontal and stables surface. The 15-amp motor enables the saw to run the blade at a speed of 3,500 rpm, a speed that makes miter cuts and crosscuts easy. The product also offers more versatility in cutting options. It allows the user multipurpose cutting guided by the laser light and can do compound cuts, bevel cuts, or square cuts. For the allergy conscious users, this saw may be your best bet. It is fitted with a dust collecting bag which minimizes sawdust spread. The user can also fix a 35mm hose and an aspirator to further dispose the dust off. Features two ultra-high grade carbide tipped blades (40 and 80 teeth respectively). Fitted with a vibration-reducing elastomer grip. Laser guide for guided cutting. Changing the angle is not precise. The handle is a bit weak. ​The growing need for reliable, fast, and efficient miter saws has created a surge in the number of different models being produced. These saws, assures you of extended power, durability, repeated accuracy, efficiency, precision, versatility and portability. Whether you have a long or short-term project, or you just need to cut a few 2x4, a good and well-performing miter saw will be a true asset. Regardless of your experience in the field too, you might want to try out one of them. Miter saw is used to refer to a saw that is used to make miters, and accurate crosscuts on workpieces by either mounting circular saw blades down on a board or pulling a large backsaw in quick motions. Usually, they have a blade, laser guide, blade guard, dust bag, miter table, and safety clamp. A laser guide is used to position the cutting line. It offers a precise visual indication of the cut line in a particular configuration. A blade guard works as a guard and covers the teeth of the blade. Most of the recent or modern products have self-retracting blade guards that ensure the user is safe from any unforeseen contact with the teeth during cutting. A dust bag is connected to the saws for directing sawdust away from the user and reducing after-work cleanup. The clamp is used to lock the workpiece into position during cutting. The table is used to place and support the workpiece. A miter saw is a special tool that allows the user to make precise cuts and at a variety of positions and angles. Depending on your needs, you can use the saw to cut workpieces for picture frames, window casings, door frames, crown molding, among others. The following are the main miter saws types. Sliding compound miter saw: - this type offers the versatility you get from the compound miter saw plus a sliding feature. The slide feature looks like a radial arm saw and allows the user to move the blade forward and backward. 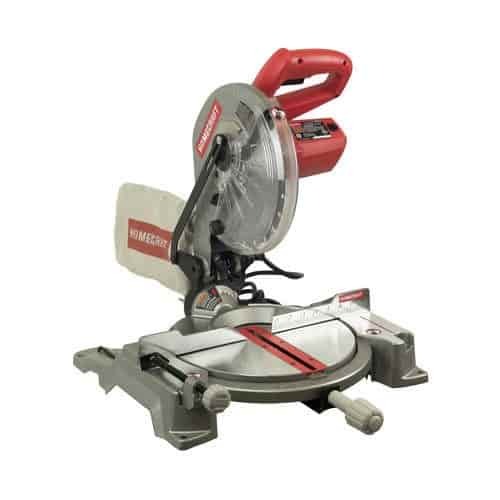 Compound miter saw: - this saw type features blades that pivot to the right and left to make angled cuts. For beveled cuts, they are tilted in a single direction. If the saw is manipulated on both axes, the result is a compound miter cut. Dual compound miter saw: - a dual compound saw functions like a compound saw only that while the compound miter saw tilts in one direction one, the dual one tilts both to the right and left. The different components of the saw make it run. Without one of the key items, it would be as good as useless. The motor is the heart of the miter saw. It runs the machine by producing the power that spins the blade. The blade does the cutting. The workpiece is placed on the surface table, and the miter and laser guide are used to focus the cutting, and the blade is lowered to the cutting line. If the job site does not have enough lighting, a laser guide system works together with the miter for precision. Finally, the dust collection bin comes in for its shift. It collects much of the sawdust from the cutting and helps to avoid much clean-up after work. Basically, the blades come with 10in or 12in options. Identifying the saw that fits your needs will be vital for the best results. The next step is deciding whether you need a laser guide or not. If your project needs clear and precise cuts, then buying a miter saw with a laser guide will be a perfect idea. Also, you might want to buy one with the laser guide if you are working indoors. Sliding or Compound Miter Saw? How you will be using the saw will determine whether you should buy a compound or sliding one. 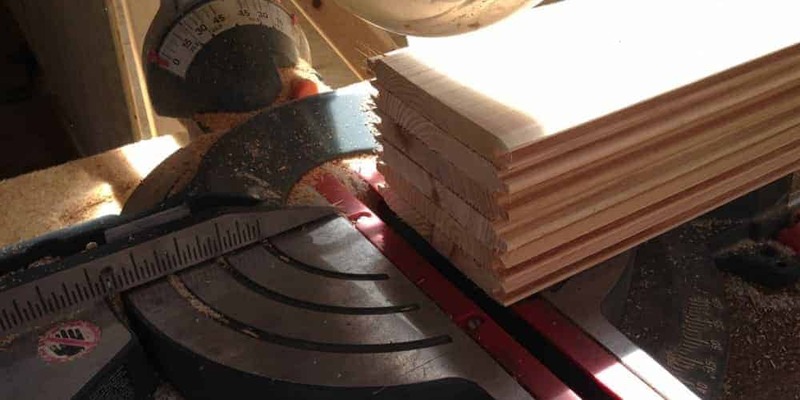 For instance, if you need angled cuts with two planes, a compound saw will do while a sliding one will be the best for forward and backward cuts. The miter saw you choose should also guarantee you top industry cutting capacity combinations. It should, therefore, interest you to have the desired vertical, horizontal, and nested crown cutting capacity put into perspective before setting for a particular product. The angle design is another key point to note. Ensure the product you are settling for can guarantee an innovative back fence design that can, in return, offer you an efficient inch and degree combination. While buying a miter saw, it is also important to ensure it has a fitting motor to RPM ratio. the RPMs should also be designed for the particular blade fitted and your decision should be based on your specific needs. Q. What is a miter saw used for? A. The tool the helps the user to make cuts on a workpiece at different angles. You can use it to make cuts for picture frames, window casings, crown molding, or door frames. Q. Is a sliding compound miter saw the same as a compound miter saw? A. No, the two are different. For a stationary compound miter saw, you will use a pivot arm to flip the saw. 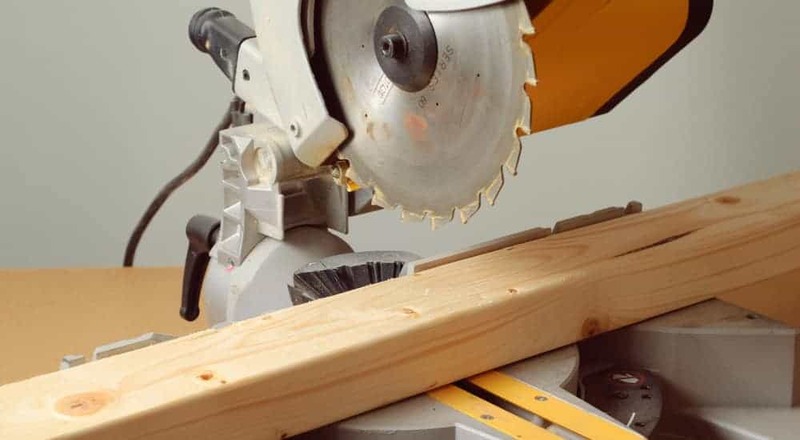 As for a sliding compound miter saw, you will make it using rails that allow it to slide the saw forwards and backward. Q. Do I need a double bevel miter saw, or a single one can do? A. You can have a single bevel saw for making miter and bevel cuts at the same time or independently. Q. How can I improve the quality of my cuts? A. By replacing dull or damaged blades, using blades with higher tooth counts, or making the downward strokes consistent. Our top pick for the best budget miter saw is the DEWALT DW715 15-Amp 12-Inch Single-Bevel Compound Miter Saw. The product offers nothing short of precision and is a great companion for perfectionists. With a 15-amp motor that drives the blades at 4,000 rpm, you are guaranteed of extended power, speed, precision, and durability with your desired results. If your budget is the determinant, the Hitachi C10FCG Single Bevel Compound Miter Saw, our budget pick would be a good option. Our budget and premium picks make a run for the competition too. The Hitachi C10FCG Single Bevel Compound Miter Saw and Homecraft H26-260L Compound Miter Saw also make a count as some of the most sought-after miter saws.